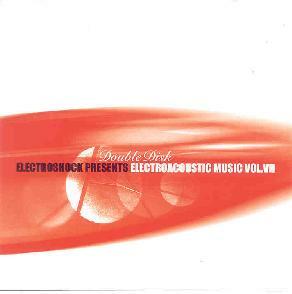 Various Artists - "Electroshock Presents Electroacoustic Music Vol. VII"
From France, Claire Laronde's contribution is one of the strongest. The music begins with a short bit that combines often fiery classical piano with atmospheric electronics. But the main portion consists of layered bubbling and howling electronics along with the piano to create a piece that is atmospheric but highly thematic. There's lots of variety here and I dig the sci fi fun, the frantic piano runs, and the way Laronde continually but seamlessly evolves from one aural scene to the next. Truly a highlight among all the artists on the set and as the opener she presents challenges to the rest. The compilation includes two Belgian representatives. Vidna Obmana's offering is a powerfully intense orchestral piece that excels at creating scenes in the listeners mind (though I didn't hear as exciting an array of sounds as I did on the Laronde piece). Geert Verbeke creates wonderful sounds with percussion, the best part of the track being the head throbbing sounds he gets from simple bangs on a gong. Roderik De Man (The Netherlands) combines wind instruments (clarinet?) and electronics to create an orchestral piece that also has a Univers Zero styled darkness and intensity. De Man keeps the music consistently interesting and succeeds at creating an edge-of-your-seat suspenseful feel. I really loved the combination of clarinet and orchestral electronics, straddling the line between the accessible and the avant-garde. Rodrigo Sigal (Mexico) combines chamber music with freaky electronics. At times I hear Kronos Quartet and at others the almost zany sound of Carl Stallings. Lukazs Szalankiewicz (Poland) contributes one of the more ambient moments of the set (though there are noise elements). Also from Poland, Michal Bukowski's track is reminiscent of 1970's Tangerine Dream or Vangelis. Robin Julian Heifetz (USA) creates a cacophonous combination of horns and electronics. Kind of like the Sun Ra Arkestra at their wildest along with a full electronic orchestra. My favorite parts of any of these tracks are the wild, often contrasting combinations of traditional instruments and freaked out electronics and Heifetz serves up oodles. If you're wearing headphones this one will force you to turn the volume down. Another one of my favorite tracks. Contributing about 36 minutes of music, Brazilian Jorges Antunes reaches into the archives to offer a 4-part 17 minute piece recorded in 1970 that at various points consists of quietly ambient drifts, seriously brain damaging noise, experimental electronic and sound noodlings, and UFO synths. Antunes also contributes a more recent 19 minute work of bubbling electronic constructions, hand and foot tapping percussion (sounds like a Fred Astaire softshoe) along with hyperventilating breathing and other freaky voices, Phantom of the Opera organ, intense wall of sound segments that feel like they're about to launch into rock song, and much more. I particularly liked the electronics that form the backdrop for an avalanche of breaking dishes. Smashing glass and thundering percussion blasts synchronize elegantly making for a somewhat violent avant-symphony. Overall this lengthy piece would have been better being 2 for 3 separate tracks as the different themes don't always flow seamlessly into the next. Still, there's lots of good ideas here and I'd be interested in hearing more of Antunes' music. Jose Mataloni (Argentina) offers an intriguing blend of voices, acoustic and electronic sounds, and actual musical sequences produced by piano and stringed instruments. A somber chamber ensemble is combined with urban traffic sounds, conversations and strange voicings, and a variety of clanging, bashing and harsh electronic sounds, showing how extreme contrasts can be thoughtfully and creatively combined to produce something that somehow seems to work well together. OOPHOI's (Italy) track is a dark ghostly ambient piece that borders on the orchestral, much like the music on his Bardo CD (see review this issue). Arie Shapira (Israel) gives us a rather difficult track that sounds like someone flicking the needle around on an LP. I had a tough time with this one. In contrast, Mirjam Tally (Estonia) plays flowing ambient music given an ethereal feel by what sounds like the delicate raking of piano strings (or a harp perhaps?). And finally, Eternal Wanderers (Russia) contribute another one of my favorites consisting of electronic space with multiple layers of electronic waves, swirling UFO synths, and various other cosmic tapestries. Very good. I'd definitely be interested in hearing more from them. In summary, this and all of the other editions of the Electroshock Electroacoustic compilation series are sure to please fans of the genre, particularly those who like avant-garde music that doesn't drift too close to the abstract.